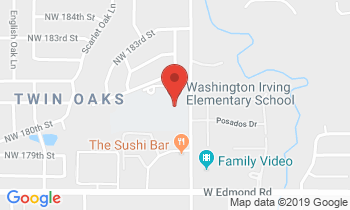 Washington Irving Elementary School in Edmond will celebrate its 25th anniversary with a community celebration from 2 p.m. to 4 p.m., Sunday, May 15, at the school which is located at 18101 N. Western. A short program will begin at 2:30 p.m. and include the introduction of special guests and a video presentation showcasing the school’s history. Washington Irving opened in 1991 and was named after the famed 19th century American author of the same name. It was the first Edmond school to be named a Great Expectations Model School-a designation it has earned for 11 straight years. “The basic principles and classroom practices of The Great Expectations teaching/training model help our students to become self-directed critical thinkers and contributors in the classroom as well as in society,” said Frank. Another unique characteristic of the school is its butterfly garden which doubles as an outdoor classroom. “Students study the life cycle of butterflies, track their migration paths and learn about the variety of flowers that attract them. It’s a favorite activity here at Washington Irving,” said Frank. The anniversary celebration is open to community members, past and present students and their parents and retired staff members. “We look forward to seeing the educators who gave hundreds of years of service to Washington Irving students and their families,” remarked Frank. For more information on the anniversary celebration, call 405-340-2210.